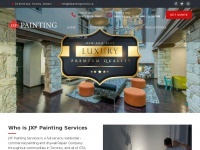 JXF Painting Services is a full service residential – commercial painting and drywall Repair Company throughout communities in Toronto, and all of GTA. We bring a variety of painting services like residential painting, commercial painting, industrial painting in Toronto. Our staff including painters, construction managers, project controllers, estimators, resident engineers and special inspectors have proven experience. With over 25 years of experience in painting industry we provide the best painting services in GTA. Our work has been featured in many holiday home events and trade shows. Due to our success our work has thrived through customer referrals for over two decades. 1 review has been written for Jxfpaintingservice.ca yet. two profiles were found for Jxfpaintingservice.ca in social networks. Among other social networks the website is represented in Facebook and Twitter. The web server used by Jxfpaintingservice.ca is located in San Francisco, USA and is run by CloudFlare. This web server runs 2 other websites, their language is mostly german. The webpages of Jxfpaintingservice.ca were developed using the programming language PHP. The website uses the shop software system WooCommerce The website uses the latest markup standard HTML 5. The website does not specify details about the inclusion of its content in search engines. For this reason the content will be included by search engines.